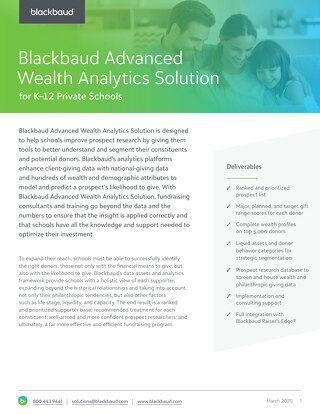 For more than 30 years, Blackbaud has developed and delivered powerful solutions that have helped hundreds of K–12 schools reach new donors and cultivate new revenue streams to support their missions. 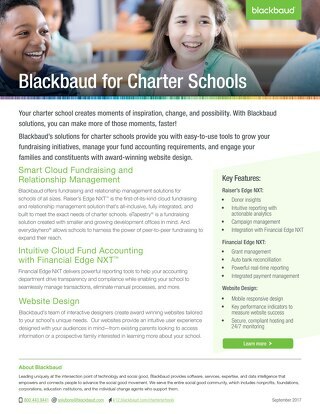 Now, with the Blackbaud Raiser’s Edge NXT solution line, schools have access to the industry’s most advanced, fully integrated cloud suite designed exclusively for K–12 fundraising. 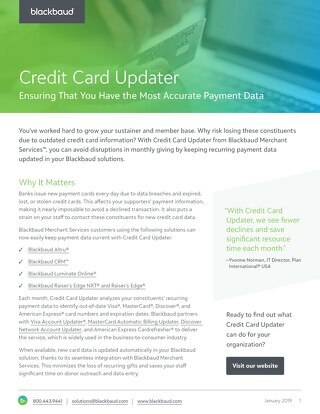 No other nonprofit cloud solution can match the intelligence, accessibility, performance, and user experience the Blackbaud Raiser’s Edge NXT solution line delivers—all with dramatically reduced IT and third-party costs, hassle-free upkeep, complete security, and the world’s largest support network. Blackbaud Raiser’s Edge NXT is a complete fundraising and alumni management solution that enables schools to operate more efficiently, reach new donors, and expand their revenue streams. 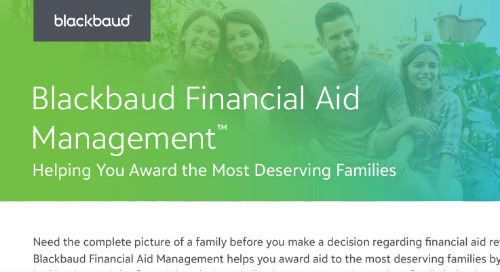 And it’s delivered in Blackbaud’s unique open cloud platform—the only fast and secure cloud that truly integrates core solutions and can be extended for the specific needs of schools. Blackbaud Raiser’s Edge NXT is a complete fundraising and supporter management solution that enables schools to operate more efficiently and raise more support for their purposes. 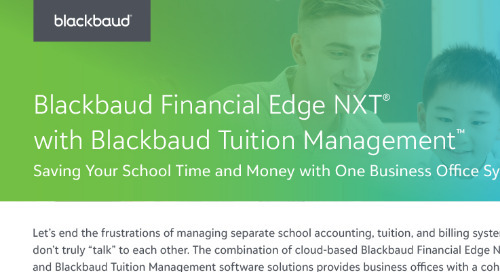 Blackbaud Raiser’s Edge NXT allows schools to operate more efficiently by streamlining data, reporting, and processes to set a stable foundation for growth in one smart, all-inclusive cloud solution. Streamline your fundraising: Save time and money by consolidating disparate processes, communications, and donor data into one easy-to-use donor information management solution. Achieve a clear view of performance: Make smarter, more efficient decisions with intuitive reporting and dashboards that track key fundraising metrics, such as donor retention and acquisition. Connect your school: Easily access and share information across your departments with an open cloud platform that integrates data across systems. Blackbaud Raiser’s Edge NXT makes it easy to reach and engage new donors with acquisition tools that help you communicate and fundraise more effectively to bring new support to your school. Reach more supporters: Increase reach with data enrichment services that find missing addresses, emails, and phone numbers for you. Increase engagement: With simple email marketing, it’s easy to engage with alumni and understand the impact of your campaigns across channels. Raise more money: Automatically process online donations, pledges, and payments through your website—no manual entry required. Blackbaud Raiser’s Edge NXT comes standard with the cultivation tools that help you act on key insight to retain your existing donors and empower them to grow over time. Retain more supporters: Discover donors at risk of lapsing, and take action to drive more recurring gifts. 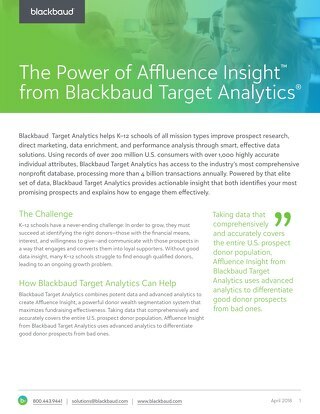 Upgrade major donors: Target top prospects to solicit gifts with wealth analytics that finds likely major donors and recommends the gift size you should be asking for. Expand your reach: Empower your best supporters to raise money on your behalf with crowdfunding tools that make it easy to gain viral support. Blackbaud Raiser’s Edge NXT is a holistic solution with online fundraising, analytics, payments support, and training in one subscription price. Get started quickly with minimal up-front investment and comprehensive, value added packages that reduce the need to purchase add-on modules.